When something feels uneasy, or confusing – or even when you feel you lack the clarity in order to make a decision – press the PAUSE button. We eagerly want to find solutions or resolve situations that we feel uneasy or uncomfortable about. Sometimes it even feels as if time is running out, or we are pressed for an answer! When we don’t press PAUSE, we will get in the way of Guidance. We would want to control the outcome from a fear perspective or based on assumptions and what ifs. We need dual perspective, we need to see the Divine Light in the situation, and we need to see the truth of the situation. Does something feel out of integrity? 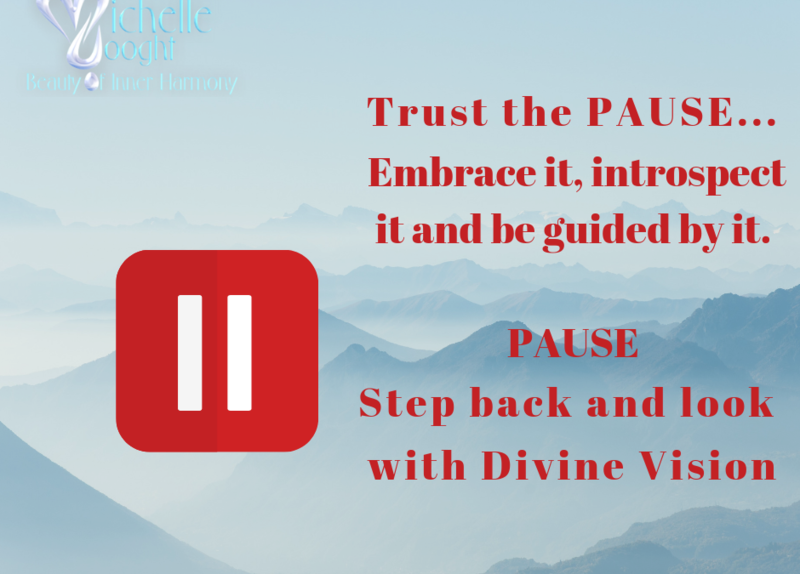 When we are in PAUSE mode, it allows us to step back and see with Divine Vision. We can ask our Guardian Angel to open our eyes and place the situation in the Light, it allows us to be a witness, rather than a part of the situation. As a witness, holding the intention of light and the highest good outcomes, we can see things completely differently, from different perspectives, from a point of balance perhaps. IT is then that we are able to decide or receive the clarity we seek, as we are in Truth and Light. Trust the PAUSE. Embrace It. Introspect It. Be Guided by It.